If you are harvesting a bounty of fresh tomatoes from your garden, or even if you find a good sale at the market, you may be trying to figure out what to do with all those tomatoes. 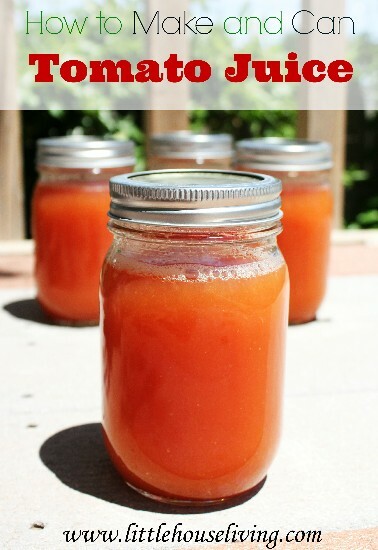 Canning tomatoes is a great way to preserve their freshness, and another great way is to make tomato juice. 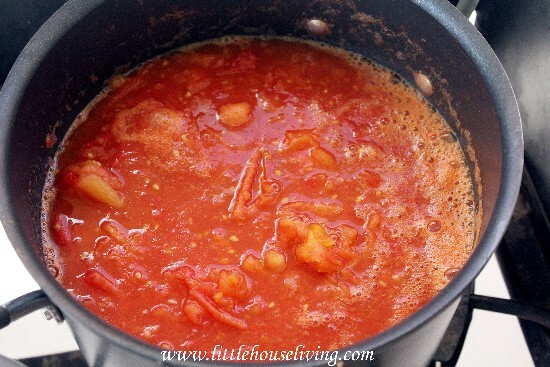 Tomato juice can be used in soups, stews, or as a base for a homemade pasta sauce. Making and canning tomato juice takes a little bit of effort, but once you taste the robust, fresh flavor of homemade tomato juice, you’ll be glad you made the effort. 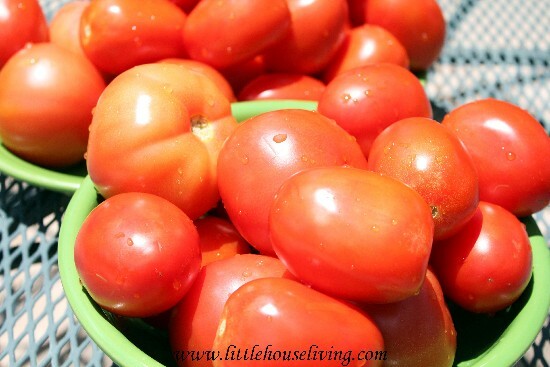 Pick tomatoes that are fresh, ripe and firm. You don’t want to use overly ripe tomatoes, because their acid levels may be too low, and unsafe for canning. 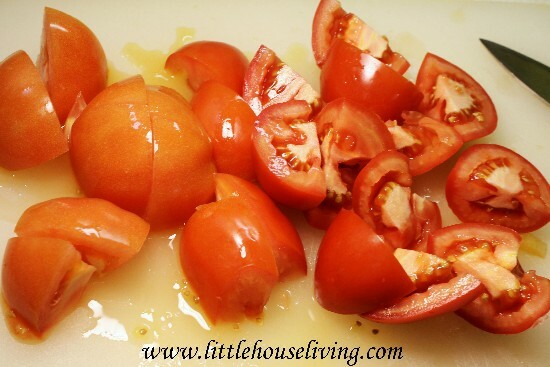 Start by washing, coring and removing any bruised or green spots from the tomatoes. Take a third of the tomatoes and cut into quarters. Once the tomatoes are cut, they start to release pectinase enzymes, which will cause the tomato juice to separate. 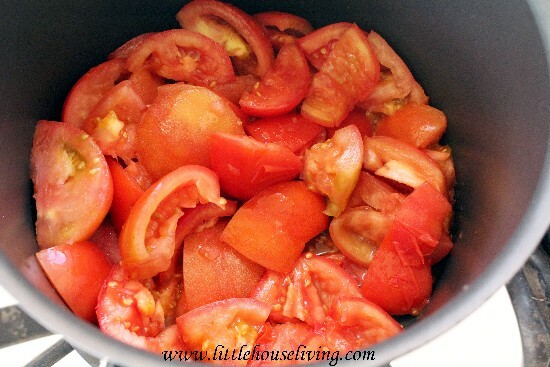 Heating kills the pectinase enzymes, so you want to put heat on the tomatoes as soon as they’re cut. 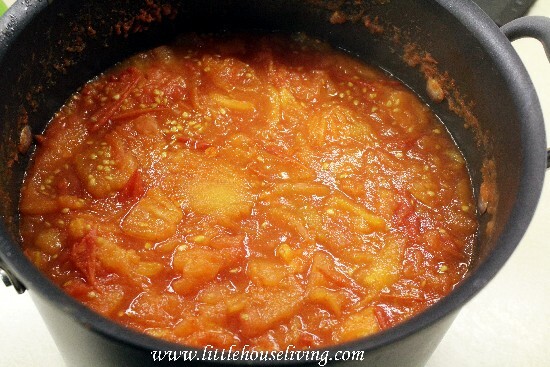 Quickly add the quartered tomatoes to a pot over medium-high heat. Using a clean potato masher, gently crush the tomatoes until they start to break down. Meanwhile, quarter another third of the tomatoes, and add those to the pot, crushing and stirring as you go. Quarter and add the remaining third of the tomatoes and continue crushing until the tomatoes are broken down. Reduce heat to medium and allow to simmer for 5 minutes. Remove from heat. 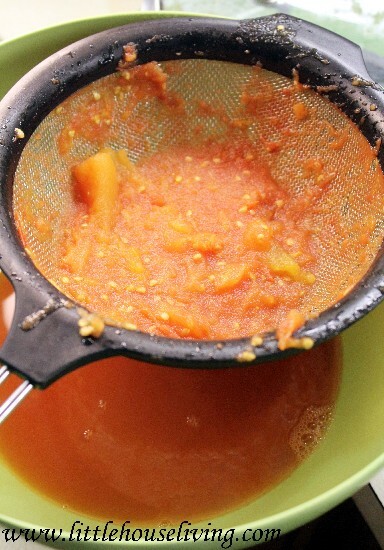 Using a sieve or food mill, separate the juice from the seeds and peels. Return juice to the pot and bring to a boil. Remove immediately and ladle into sterilized jars, using a sterilized funnel, making sure to leave 1/2″ of headspace. 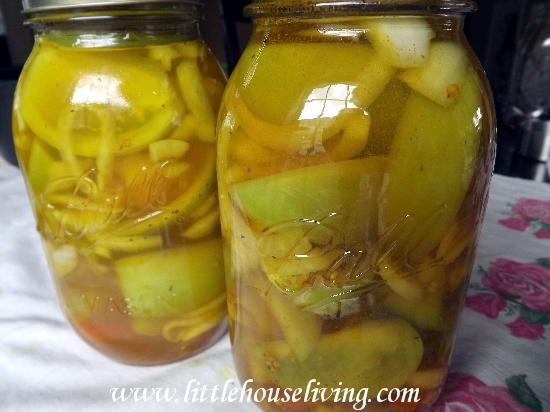 To each jar, add 1 tbsp of bottled lemon juice or 1/2 tsp of citric acid. I also added 1 tsp of salt to each jar for taste, but that is optional. Wipe the rims of cans with a clean paper towel and top with sterilized lid and rim and tighten until finger-tight. Fill your water bath canner with water and bring to a boil. Process in water bath canner for 35 minutes. 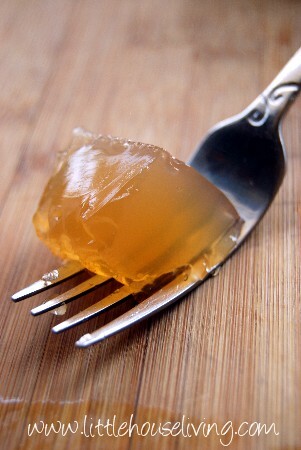 Carefully remove, and allow to set undisturbed until the jars have properly sealed. For this recipe, I used 12 pounds of mixed roma tomatoes and red round tomatoes. 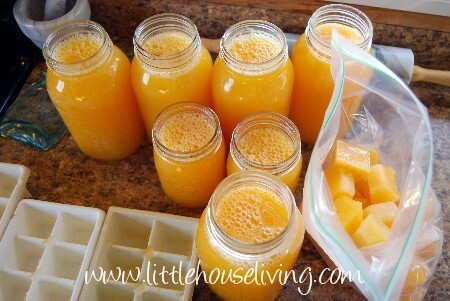 I extracted enough juice to fill 6 pint-sized jars. And now you know how to can tomato juice! Will you be canning any tomato juice this year? What tomato items do you can? I always end up with some tomato juice to can! As my sauce is cooking down, I drain some of the juice, and can’t stand the thought of dumping it down the sink, so I can some of it, it’s great as a soup base, or to cook pasta in to give it a nice mild flavor, so delicious! Some of the ‘juice’ I’ll use to water some of my garden plants, the way I look at it, it’s extra vitamins for the plants in the ground! I also can tomato juice, but was wondering if you had a recipe for a V8 like juice? I love V8, but hate all the added crap to it. I canned tomato juice today and didn’t hear it first so it seperated. Does this matter really? No, it shouldn’t make a difference in the final product. Just mix before using. What can I do when my tomato juice is too watery? 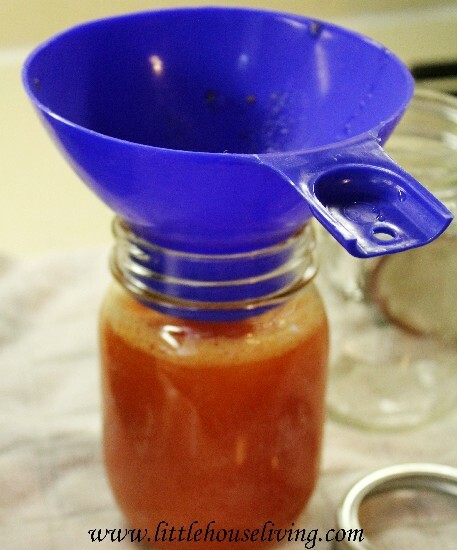 Tomato juice is generally pretty watery, you could try boiling it down longer next time or canning a different kind of tomato. How much lemon and salt would you put in a quart jar?